Exceeding client’s expectations, especially in the areas of timing and budget, is our constant goal. That can only be achieved by our experienced, on site construction professionals. 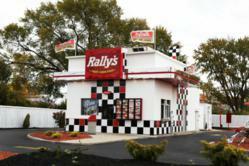 Contracting Solutions LLC was selected by Checkers Drive In Restaurants, Inc., parent company of Rally’s restaurants, to be the general contractor for major renovations for the Rally’s at 700 Georgesville Road in Columbus, Ohio. The renovations are a part of Checker’s 800 store, chain wide initiative to change their image while improving functionality and curb appeal. The project comes on the heels of a similar project completed by Contracting Solutions for Checkers at a Rally’s location in Cincinnati, Ohio in August of this year. The retro 1950’s diner image of the restaurant was developed by Columbus based, strategic brand and design firm Chute Gerdeman. The look was achieved by completely removing the building’s exterior and replacing it with black, white, and red checkerboard tiles, a wrap around stainless steel awning with neon look, LED lighting and a new white stucco finish. Upgraded landscaping and new exterior seating were also added to complete the transformation. Contracting Solutions is a general contractor specializing in building renovations and tenant improvements. Growth in a slow economy has been achieved by adherence to their core principals of honesty, integrity, fairness, dedication and unparalleled communication with their clients and vendors. Learn more about Contracting Solutions by visiting them on the web at http://www.cs-gc.com, on Facebook or by calling them at 614-890-9090.